Gastrointestinal Problems | Dr Joe McSweyn L.Ac. O.M.D. This is a broad category, if you click on the drop down, more in this category will show in a sub heading. Many years ago I had major stomach problems. My stomach hurt sporadically with such intensity that it often took my breath away. I have even passed out twice from the pain. I went to numerous doctors, none of which could tell me what was wrong and some even suggested that I could be imagining the whole thing. It got to the point when the pain lasted for two months straight. Then someone recommended Joe. I was skeptical but felt like there were no other options. I came to Joe and did everything he said perfectly for two months. Then two years later I remembered that there was such a thing as stomach pain. I was shocked to discover that Joe did such an awesome job treating me, that I even forgot what pain felt like. I’ve since recommended quite a few people to see Joe. They all did and he helped every single one of them. 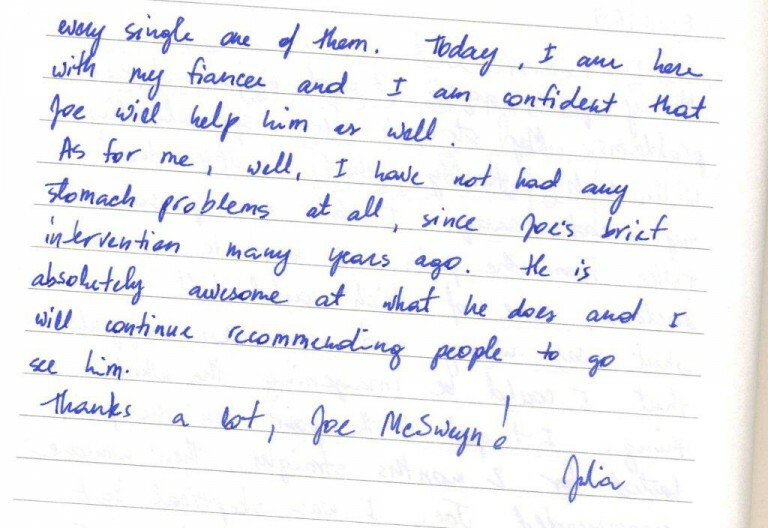 Today, I am here with my fiancé and I am confident that Joe will help him as well. As for me, well, I’ve not had any stomach problems at all, since joe’s brief intervention many years ago. He’s absolutely awesome at what he does and I will continue recommending people to go see him. Thanks a lot Joe McSweyn!